They are HDPE Tape woven out of highly tensile monofilament and are widely used as a support system for portable beds and chairs, in handles, thaila-thaili, (sack, carry bags, pouches) etc. They are strong enough to sustain heavy loads and are also used for making luggage and luggage tie during traveling and transportation. They are available in sizes ranging from and forms like 1” JIBRA, 1.5” JARI, 2” JACQUARD, 2” PLAIN, 2” & 1” WHITE with an option for customization. 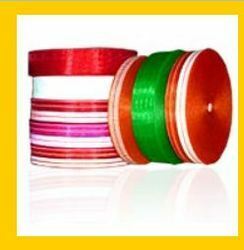 We can manufacture Niwars in myriad of patterns and colors depending upon our customers' requirement. Manufacturer of HDPE monofilament yarn, HDPE niwar, braided rope, black twine etc.